We learn best by doing. Informed by astronomy education research, the Sixth Edition reflects an emphasis on learning by doing. This emphasis is reinforced through thoughtful pedagogy and an innovative teaching and learning package. Students get to interact with astronomy while instructors receive the resources they need to incorporate active learning into the classroom. Instructor exam copies of this edition will be available in December 2018. Student copies and accompanying resources will be for sale starting July 1, 2019. The text and media truly engage students in doing astronomy—giving you more options for teaching an active course. Process of Science figures have been reimagined to provide clearer, more visually appealing representations of important discoveries. They are supported by assignments in Smartwork5 online assessment. A NEW Interactive Instructor’s Guide and a teaching blog from author Stacy Palen provide a wealth of ideas and resources for engaging students in the classroom. Smartwork5 allows you to easily assess students using interactive, visual content that works on a tablet or computer. Answer-specific feedback is provided for every problem in the course. It’s easy to get started with pre-made assignments created by Astro 101 teachers. And it’s also easy to customize—problems are sorted by learning objective and corresponding textbook feature. Our award-winning At Play in the Cosmos videogame is the ultimate learning-by-doing tool. This app offers challenging yet fun ways to apply course concepts to complete missions and earn achievements. Student progress is reported so instructors can make the game part of the grade. Whether used before class to spark discussion, during class to promote collaboration, or after class to apply what they’ve learned, student feedback is overwhelmingly positive. The activity workbook, Learning Astronomy by Doing Astronomy, brings collaborative participation to the classroom through group activities. All activities are based on astronomy education research. 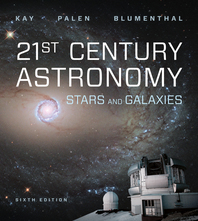 Free when packaged with any Norton astronomy text, it is a truly distinctive supplement with undeniable value.